Correct wire retainers included. RH and LH set. 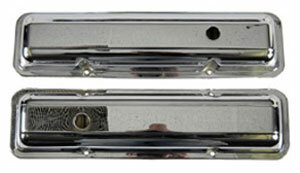 Accurate reproductions of original chrome plated valve covers. Correct wire retainers included. Original, factory quality chrome plating by a TS/16-944 certified OE supplier. Item is in stock and will ship within 2 business days of payment..